Alexandre Dumas is one of the greatest writers of his time. 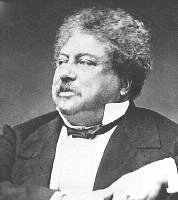 Alexandre Dumas was born on July 24, 1802, in Villers-Cotterêts, France. Few people know that Alexandre was a grandson of a Haitian slave who was also the illegitimate son of Marie Louise-Elizabeth Labouret and Thomas-Alexandre Davy de la Pailleterie, a general in Napoleon's army. His father died when Alexandre was four, in 1806, leaving the family in financial trouble. Although he did not have much money and had limited schooling, Alexandre had a happy childhood. In 1818, Alexandre's mother informed him that they had no money and that he had to find a job. Alexandre accepted a clerking position for the Duke of Orléans in Paris, where he worked as a clerk. After he met a famous French actor, Talma, and decided to become a play writer. Alexandre wrote his first play, Napoléon Bonapart, in 1825. His most popular novels are the musketeers trilogy, which includes The Three Musketeers, Twenty Years After, and The Man in the Iron Mask. Another well-known novels were The Count of Monte Cristo, Ten Years Late, and The Black Tulip. Alexandre returned to Paris in 1862. After Alexandre became ill, he was taken to his son's house in Puys, France, where he died of a stroke on December 5, 1870. Two years later, his remains were transported to the place of his birth, Villers-Cotterêts. A political allegory detailing the murder of John de Witte and his brother, Cornelius. Final novel in the Three Musketeers series. Artemis tries to remove the King from the throne after finding Philippe, the "Man in the Iron Mask" and the King's twin brother imprisoned in the Bastille. A man, Edmund Dantes, is betrayed by the man he considers his best friend, and after serving years in prison, seeks revenge by disguising himself as a mysterious, wealthy count. The continuation of the Three Musketeers Story, with D'Artagnan, Athos, Porthos, and Aramis once again going on adventures. A young man, d'Artagnan, travels to Paris in the hope of joining the Three Musketeers, a group of men who serve King Louis XIII. The continuation of the Three Musketeers saga, taking place two decades later. In this tale, France is on the brink of Civil War, and the Three Musketeers must come out of retirement to once again save the day.